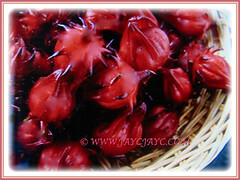 Roselle produces edible flowers and fruits that contains nutritional value, including Vitamin C and minerals. 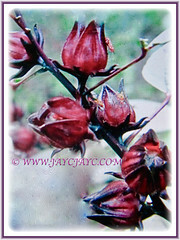 Hence, it is popularly grown worldwide to produce Roselle jam and hibiscus tea. The tea is made as an infusion from the crimson-coloured calyces of the Hibiscus sabdariffa flower. Superb when consumed as a refreshing drink on hot days! 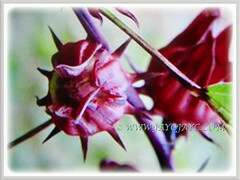 Common Names: Roselle, Red/Indian/Jamaican Sorrel, Rosella, Florida Cranberry, Assam Belanda (in Malay). Etymology: The genus name, Hibiscus is the old Greek and Latin name for mallow. One of its common names is called Jamaican Sorrel because its edible leaves look and taste like Sorrel. The other common name Roselle is a Swedish baby name, meaning Rose. Origin: Native to tropical West Africa. It is naturalized and cultivated worldwide. Plant type: An ornamental, herbaceous and annual/perennial plant. 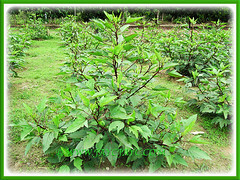 Features: Hibiscus sabdariffa is from the genus Hibiscus that consist of several hundred species of flowering plants. A fast-growing plant, Hibiscus sabdarifffa is a robust, erect, multi-branched and bushy subshrub that grows to between 2–2.4 m tall and almost as wide. It bears simple, dark green leaves with reddish veins and serrated margins, with three to five lobed and have petioles. They are 8–15 cm in length and arranged alternately on the reddish cylindrical stem that is almost smooth. 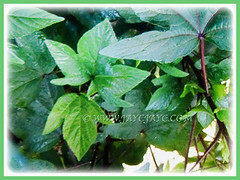 Its dark green foliage contrasts beautifully with the red stems and flowers. The hermaphrodite and solitary flowers that are borne in the leaf axils are 8–10 cm in diameter. When the showy hibiscus-like flowers first open, they are yellow or buff with a dark red spot at the base of each petal, and will turn pink as they wither at the end of the day. It is a short-day plant. They have a stout fleshy calyx at the base, 1–2 cm wide, enlarging to 3–3.5 cm, fleshy and bright red as the fruit matures. Flowers are pollinated by insects. At this time, the typically red calyx, consisting of 5 large sepals with a collar of 8 to 12 slim, pointed bracts around the base, begins to enlarge, becomes fleshy, juicy and fully encloses the velvety capsule, which is green when immature and 5-valved. 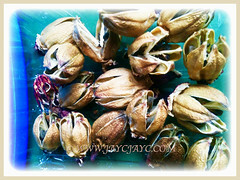 Each valve containing 3 to 4 kidney-shaped, light-brown seeds, 3-5 mm long and minutely downy. The capsule turns brown and splits open when mature and dry. 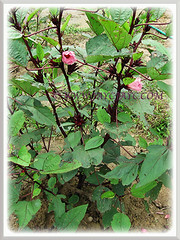 Culture (Care): Hibiscus sabdariffa or Roselle can be easily grown with minimum care. Moisture: Medium water needs. Water moderately and regularly during extreme heat. Soil: Humus-enriched, loamy and well-drained soils. Nevertheless, it will adapt to a variety of soils. Others: When planting in the ground, grow the plants at least 1 m apart so that they have plenty of space for root expansion and allow them to reach their full height and fruiting potential. Harvesting the flowers regularly encourages new growth. Little to no fertilization is needed. If you desire, feed once monthly with a slow time release 15-5-10 fertilizer, away from the the base of the stems. Weed around your plants in the beginning. When the plants grow vigorously, it will shade out weeds on their own soon enough. Generally free from serious disease or insect problems. However, they are prone to root-knot nematode, beetles, caterpillar, scales, aphids and mildew. 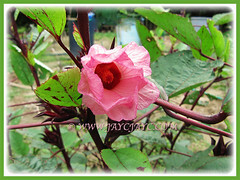 Hibiscus sabdariffa or Roselle is very sensitive to frost. It grows best in tropical and subtropical regions where it tolerates a warm and humid environment. It is a short-lived perennial in zones 10-11 while an annual elsewhere. To propagate, plant seeds outdoors in zones 8-11. For colder regions, start seeds indoors and transplant them outside after all danger of frost has passed. Place the plants at least 1 m apart so that they have plenty of space to grow. Alternatively, you can easily propagate from cuttings. Blooming starts from late summer to early fall when the days grow shorter. Propagation: Easily propagated by seeds or cuttings. 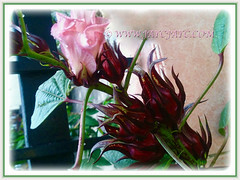 Usage: Hibiscus sabdariffa or Roselle is ideal in flower beds and borders. Grow it as an attractive plant in your home garden. Suited to be planted in rows to make a dense hedge. This beauty is extensively grown for its traditional medicine. Parts of the plant are used as a diuretic, mild laxative, to lower fevers, soothes cough, etc. It is primarily cultivated for the production of bast fibre from the stem which may be used in making burlap sack. 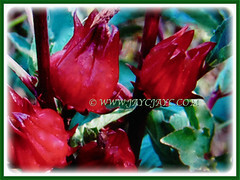 Its red calyces are used for food colourings, jams and beverages. In some countries, it is used as vegetable or salads in their traditional cuisine.